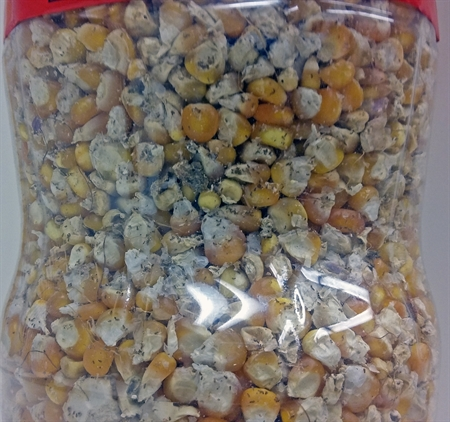 Insect pests can significantly damage stored seeds. Pests such as the cowpea bruchid (Callosobrachus maculatus) are considered primary pests in that the larval stage feeds within intact kernels. 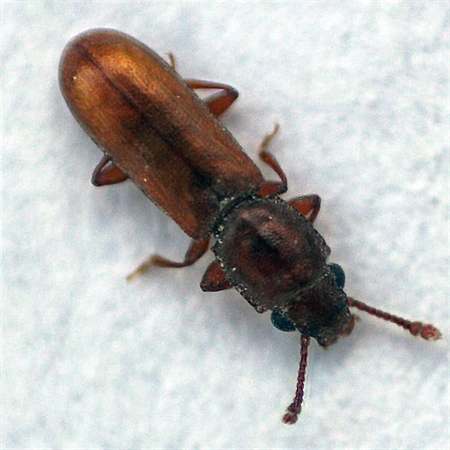 Others, such as the saw-toothed grain beetle (Oryzaephillus sp. ), are secondary pests that attack damaged seeds. Biogas produced with animal manure is often promoted for use as a household fuel. Farmers generating their own biogas could also use it to control insects in stored seeds, an idea that was addressed in ECHO Asia Notes (Issue 28). We were curious to know if biogas would be effective against saw-toothed grain beetles (see photo below) found in a batch of maize seed. 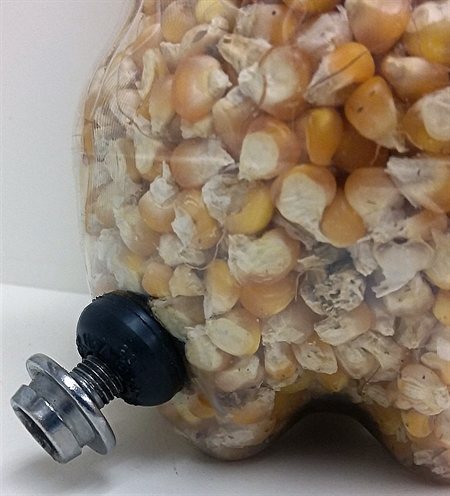 To find out, we used tire valve stems to connect a container of seeds to an inner tube filled with biogas from a barrel digester. Biogas was released into the bottom of the container through a hollow valve stem; the core of the bottom/intake stem had been removed. As biogas was released into the container, air was vented several times by pressing the pin of the core of a valve stem at the top of the container; this ensured that oxygen was exhausted and replaced by biogas (a mixture of methane and carbon dioxide). 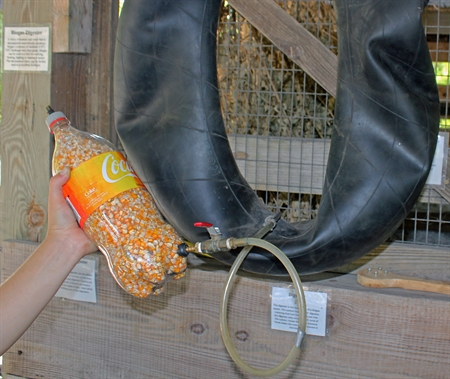 As the photo below shows, there was not a lot of biogas in the inner tube, so the tube was squeezed by hand to force biogas into the container. 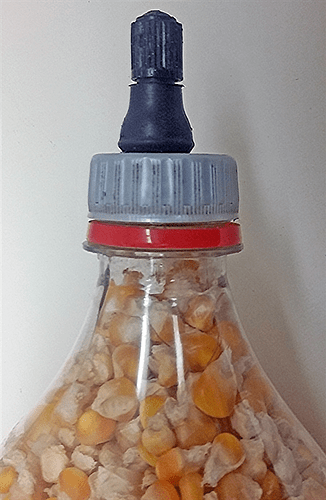 We then disconnected the hose from the inner tube and quickly inserted a stopper into the valve stem at the bottom of the container. In this way, biogas was trapped inside the container. RESULT: Saw-toothed beetles stopped moving within hours. Weeks later, no live insects were observed in the container. Questions still remain, such as exposure time needed to control various insect species. Also, there are some CAUTIONS to be aware of. Biogas is flammable, so exercise the same caution as you would for working with biogas digesters in general. Biogas can contain harmful amounts of hydrogen sulfide; research is needed to find out if seeds ventilated after treatment are safe for food consumption—germination tests could be done to determine if biogas-treated seeds are viable for planting. Nevertheless, this simple test suggests that biogas holds promise as a tool for managing pests in stored seeds. Seed container with stopper inserted into biogas intake valve stem after biogas had been released into the container. Note—we are open to ideas for ways to more easily connect and disconnect a seed container to a biogas source. Insects controlled with biogas–saw-toothed grain beetle at various growth stages.